You can now edit your Google business listing directly on the Google Search. 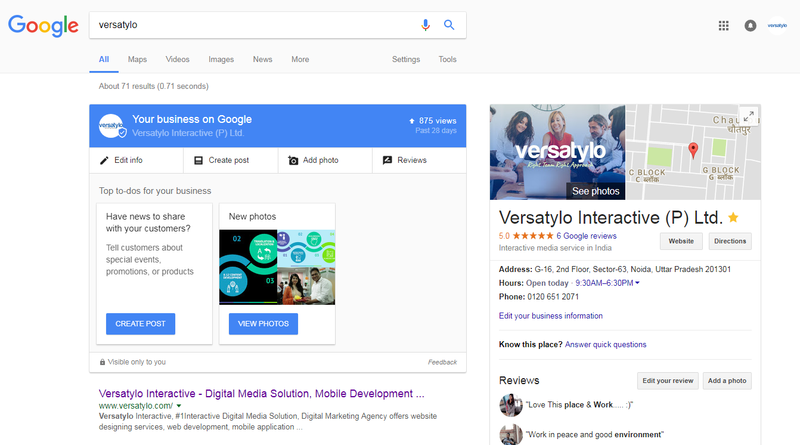 When you search for your business name on Google, you may see the opportunity to edit your business information directly from the Search results page as on above screenshot search for “versatylo”. Only owners and managers of business listings who are signed in to Google can edit some of their business info without going to Google My Business and only the owner and managers of the listing will see these options. Make sure that you’re signed in to Google with the account that you use to manage your business listing. Search for your business on Google.com. You may need to use long keywords like add your business name and city. Click Edit information to edit your info directly from Search, Add photos to add new photos to your listing in Google My Business, or Do more with Google My Business to access the full range of listing management options. Versatylo Interactive is a Professional Website Design and Development, Search Engine Optimization, Graphic Design and Interactive Media Development Company which gives the latest approach to design your website. Website design is very necessary part of any kind of business to get more revenue.